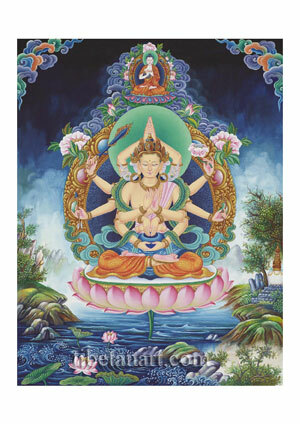 Namasangiti (Tib: mtshan-brjod), is a special twelve-armed aspect of Manjushri, the bodhisattva of wisdom, that is of particular importance in the Newar Buddhist tradition, where he is also regarded as an emanation of Vairocana Buddha, who appears above his head in this composition. Namasangiti, meaning ‘Chanting of the Names’, is a personification of the Manjushri Namasangiti Tantra, the textual prayers of which are still traditionally recited each day at many Buddhist monasteries throughout the Kathmandu Valley. Namasangiti sits in vajra-posture upon the moon and sun disc of a pink lotus that arises from a lake. He is golden or light yellow in complexion, with a peaceful face and twelve arms, and ne wears the five divine silk garments and eight jeweled ornaments of a sambhogakaya deity or bodhisattva. With his first pair of hands held in front of his heart he makes the dharmachakra-mudra or gesture of teaching. With his second pair of hands resting upon his lap in the dhyana-mudra of meditative equipoise he supports a blue alms-bowl. With his third pair of hands he makes the tarpana-mudra or gesture of offering (sprinkling) in front of his abdomen, with the tips of his fingers just touching the nectar that fills his alms-bowl. With his fourth pair of hands he holds Manjushri’s method or skillful means attributes of an arrow and bow. With his fifth pair of hands he holds Manjushri’s wisdom attributes of a blazing iron sword, and a lotus that supports a text on the ‘Perfection of Wisdom’ (Prajnaparamita-sutra). And with his sixth pair of hands folded together above the crown of his head he makes the uttarabodhi-mudra or gesture of supreme enlightenment. His six pairs of hands represent all the enlightened qualities of the ‘Six Buddha Families’, and also the ‘Six Perfections’ of generosity, morality, patience, perseverance, concentration, and discriminating awareness or wisdom. Seated upon a lotus amidst the clouds above Namasangiti’s green halo is white Vairocana Buddha, who wears the three robes of a Buddhist monk and makes the dharmachakra-mudra or ‘wheel-turning’ gesture of teaching in front of his heart.